2.2 CDTi 16v. Without doubt this will be the cheapest 2011 Vauxhall Antara (relative to miles and condition) in the country. 47,000 Miles. 12 Month MOT. Being the E CDTI edition its equipped with loads of Vauxhall factory fitted essentials and options including 2008 VAUXHALL ANTARA 2.0 CDTI 16V E MANUAL IN B LACK. Vauxhall Antara 2.0 CDTI (Diesel) 150BHP. Clean inside outside as you see n pictures. car has few minor scratches to the bodywork as you expect of this age,and small rip in driver seat (shown n pictures). own this from last 6 years and never had any problems. YOUTUBE VIDEO APPRAISAL FOR THIS CAR!! 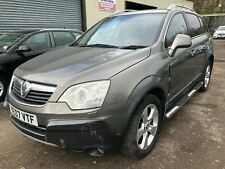 VAUXHALL ANTARA E CDTI 4 x 4. MOT APRIL 2020. 2008 - 58 REG. JUST HAD A FULL SERVICE & RECENT BELT CHANGE. 106,000 MILES (Mileage is fully warrantied and DVLA verified). HEATED SEATS. SPECIFICATION INCLUDING. Black Vauxhall Antara 2.2 diesel, All Wheel Drive, 6 speed manual. 76,400 miles, half leather interior. Good clean condition, service history. This is my daughter in laws car, the transfer box went so she has bought a focus estate while the antara was being repaired.